When you spend a lot of time around a certain genre of music you are bound to pick things up and incorporate them into your own playing. Thanks to my friend who plays fiddle tunes on the cello; James Hill, who does the same on ‘ukulele; and just recently teaching at a workshop geared towards folk instruments, I’ve been hearing the fiddle tune sound a lot lately. One instrument that is usually lacking in our local Bluegrass jams (rightfully so) is the mandolin. 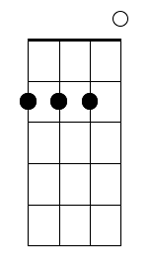 Since the ‘ukulele sits in a similar range it can take over for some of the choppy rhythm. 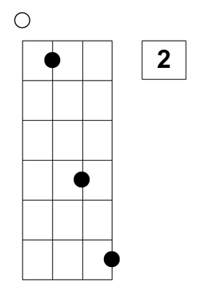 Due to its tuning, the mandolin sits across a wider frequency range than the ‘ukulele and chords played on it tend to sound “open.” If you were to create a mandolin’s tuning as a chord on the ‘ukulele it would be: 0257 (chord diagram to the right). The high string is a 5th up from an ‘ukulele’s A string so it’s a ways up there. Unless you are willing to use your thumb to fret chords like Benny Chong, it’s hard to get the same sonic range on ‘ukulele. But with minimal effort, you can at least break out of the standard grips you are used to and start playing bigger-sounding chords. 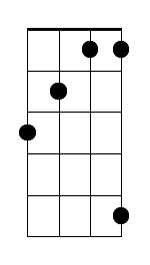 With its wide range, the mandolin’s tuning creates a lot of so-called “open chords” by default. 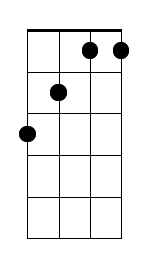 “Open” is what you call a chord when its notes span more than an octave. 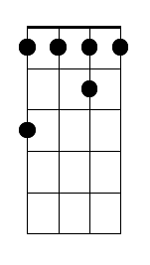 When you have a low-g string, a normal (0003) C major chord is open since it contains more than an octave worth of notes (starting on the lowest note: G). Three notes sit outside the octave. 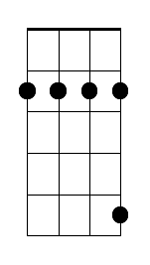 However, if you were playing with a high-g, that same C chord would be “closed” since the notes would fit inside an octave (open C would become the lowest note and the C on the 3rd fret, bottom string the highest note – a perfect octave). 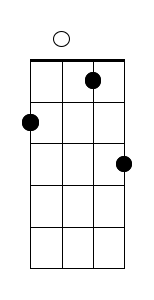 Playing true open chords are harder with a high-g, but just follow the shapes you see here and you can intentionally get bigger sounds, regardless. 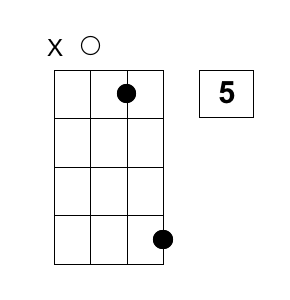 Open chords are hands-down easiest to play and most dramatic if you include open strings. Let’s look at a couple. Of course, any of these can be converted into movable shapes, but they wouldn’t necessarily be easy to play. The trick is to find shapes that are and can be moved to any key. The last F shape isn’t too bad so it can be used in any key. Some of these probably look familiar. 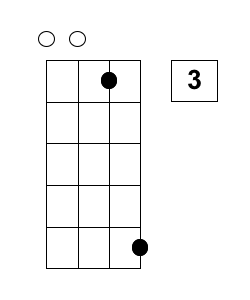 They are fairly common and not too exciting, but use them in a higher register with a chop on the 2 and 4 beats and you will be chugging along just like Sam Bush! The same concept can be applied to the basic minor shapes. You don’t use too many jazz or 7th chords in Bluegrass so you can just work on major and minor shapes. 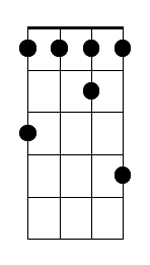 Remember that the further the notes are spread across the strings, the bigger the sound. So go and search out some of your own shapes to fit your tunes.